This pattern is my original design and is for sale for personal use. It is a quick and easy knit. Once you have learned the knit and purl stitches, and can cast on and off, you are ready to take on this project. I have included instructions for four versions using two types of Fisherman's Rib. Detailed instructions are also included for using recycled wool sweaters to make the flower and leaf embellishment. The finished neck warmer is about 22" long and 4-6" wide. 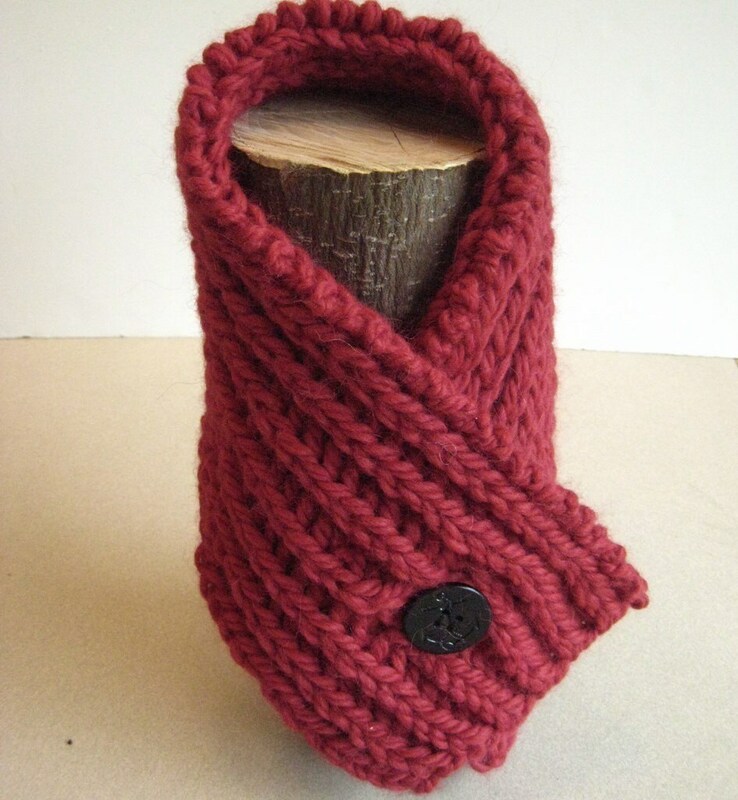 It will fit women, teens, or men and has either one or two knitted buttonhole(s) and button(s). You can knit in any bulky yarn (about 3 to 3.5 stitches per inch). I have knit this pattern with a variety of yarns including cotton and lighter weight yarns doubled or tripled. It has all the warmth of a scarf without most of the trouble! The pattern is in PDF form on four pages with clear instructions and six photos. You will be able to download your pattern instantly after purchase. Printed (hard copy) patterns are available for an additional printing fee and shipping. If you desire this option, please convo me for more information and a reserved listing in your name. Free technical support on the pattern is available via e-mail. I also sell knitted neck warmers if you don't want to knit your own. Made this item as a gift. My friend loved it! The pattern is easy to follow and knits up quickly. In the process of knitting the fisherman's knit now. It was exactly what I was looking for. Plan to make it with my home spun for a friend. I am sure it will work up nicely. I'm a reasonably beginner knitter and this pattern is knitting up beautifully. Great use for leftover yarn, easy way to learn cabling, and quick to knit. Thanks! Payment by Paypal or Direct Checkout. Idaho Residents will be charged 6% sales tax. I want you to be satisfied with your purchase and would like to deal with any concerns you have on an individual basis. If your item is lost or damaged in some way, please contact me to resolve the issue. You will be responsible for shipping costs if we agree that you will return an item. Also, items sent back for return or exchange must be in their original condition, not worn or altered. If you have any questions, please contact me. GIFTS: If you're buying a gift for someone and sending it directly to them, let me know if you want me gift wrap and include a special message from you.